Candidate for 1st Ward Alderman Lee Cabot talks to the crowd during her campaign kickoff Monday evening. Cabot is prioritizing affordable housing and increasing development in her campaign platform. 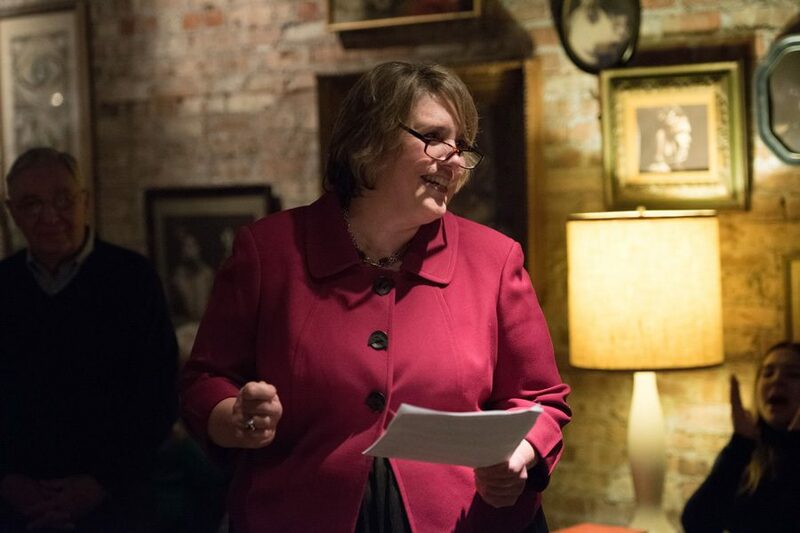 Lee Cabot (Kellogg ’86), a candidate for 1st Ward alderman, said she would prioritize affordable housing in Evanston at a campaign kickoff Monday evening. Cabot unveiled her campaign platform in front of more than 30 supporters at Found Kitchen, 1631 Chicago Avenue. Cabot is currently the program assistant for the McCormick School of Engineering’s master of product design and development management program, and she has also worked at the Evanston Historical Society. If elected, Cabot said she would focus on increasing affordable housing opportunities and balancing property taxes with school funding. The Evanston/Skokie School District 65 board voted earlier this month to place an operating referendum on the April ballots that could raise the property tax and allocate the additional funds to the district. Cabot’s campaign platform also includes fostering development in Evanston, attracting businesses to the area, preserving the lakefront and improving race relations in the city. Former Evanston Mayor Lorraine H. Morton endorsed Cabot at the event. Morton said Cabot was the right person for the job. Cabot said local government is more important than ever in light of the election of President Donald Trump. She praised Evanston’s status as a sanctuary city and encouraged Evanston to work to accomplish its goals despite potentially jeopardized federal funding and shaky state funding as a result of the budget stalemate. Cabot also emphasized the importance of Evanston residents — especially those who are displeased with the state and national political climate — engaging with their local government. Some of the attendees said they supported Cabot because they feel that she brings a challenge to the political “establishment” in Evanston. Suzanne Whiting, a member of Cabot’s campaign, said Trump’s election inspired her to get involved in local politics. Other supporters said they appreciated Cabot’s focus on bettering Evanston. First Ward resident Julie Cutter said Cabot’s initiatives would not only help the ward, but the whole city. “I think that her ideas are more Evanston forward than our current alderman,” Cutter said. Cabot will face off against incumbent 1st Ward alderman Judy Fiske in the April 4 election.